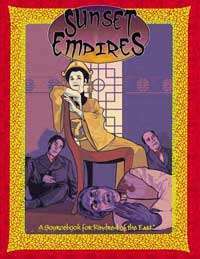 Sunset Empires is part of the history of the World of Darkness; therefore nobody gets to play the part of the wholly innocent victim. Everyone takes a role in setting the course of the Victorian Age; everyone must eventually pay the piper. This book serves as a historical setting, covering the 19th century almost in its entirety, but it also serves as a vehicle to involve characters in one of Asia's most trying times. Why discuss the Opium Wars when characters can take part in them? Why mention Japan's rapid modernization if characters can't join the internecine fighting dividing the Japanese uji? This title was added to our catalog on May 20, 2004.